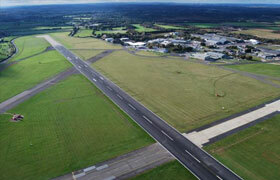 Bournemouth Airport is a fast-growing international airport with a number of private aviation clients based on site. The customer asked CES Electrical to install a generator to operate doors to an aircraft hanger containing a Boeing 747 private jet, the generator functions as a backup power source to maintain operations and supply power in the event of a power cut. The client also required a generator that could balance the need for performance and efficiency, with the site’s statutory noise restrictions. As recommended by ourselves following extensive load testing of the doors a trailer mounted Himoinsa 80 KVA super-silent generator was supplied.